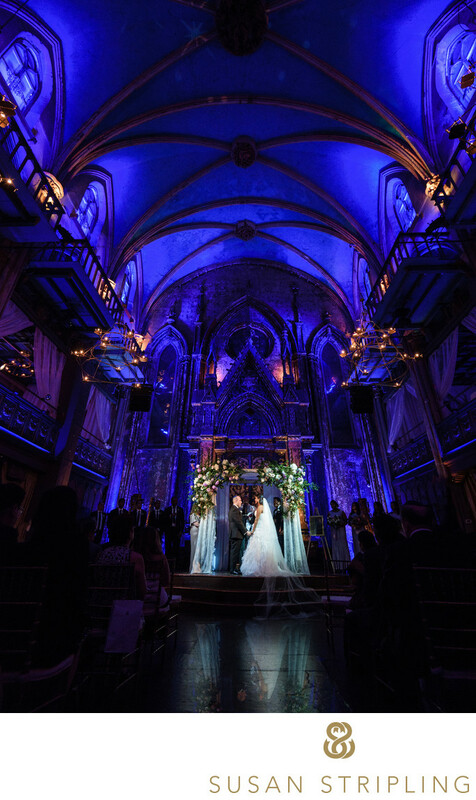 An Angel Orensanz wedding truly has to be seen to be believed. I had looked up this brilliant venue online and visited the area many times before this wedding, but I was still unprepared for how miraculous a venue this truly is. There are many quirky, unique wedding venues in the NYC area. Just a quick google search of "quirky NYC wedding venues" or "unique wedding venues in NYC" turns up a huge result! Established in 1992, the Angel Orensanz Foundation has been a resource to artists for over two decades. Citing inspiration and great welcome to and from Philip Glass, Spike Lee, Alexander McQueen, Arthur Miller, Salman Rushdie, Alexander Borovsky, Maya Angelou, Chuck Close, and Elie Wiesel, the Angel Orensanz Foundation has been a force in the New York cultural scene for decades now. Open for weddings, the the Angel Orensanz is one of the most unique, beautiful wedding venues in the entire New York area. This spectacular Angel Orensanz wedding was beautifully organized, running like clockwork from a well-timed schedule. We started our day at the venue itself, where the bride got her hair and makeup done and the groom enjoyed some time with his groomsmen. I spent some time with the videographers documenting the details of the day, as well as the final preparations of the bride and groom. After the bride and groom were both dressed and ready, they saw each other in the brilliant light of the foyer of Angel Orensanz. 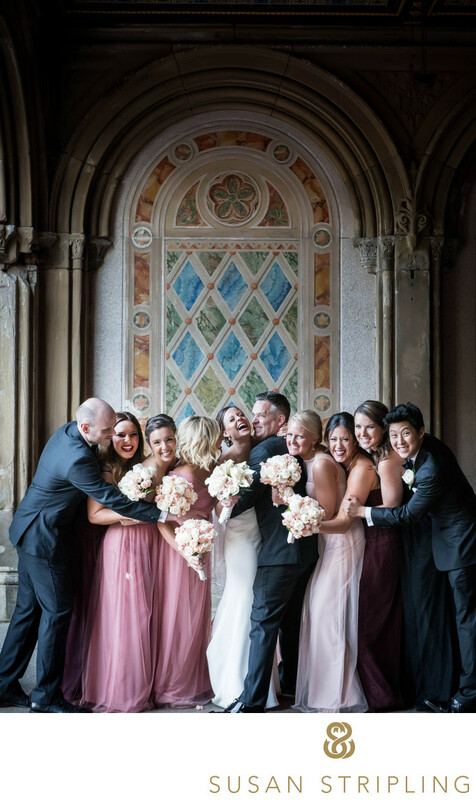 They exited into a waiting limo with their entire bridal party, and we took off for portraits in New York's iconic Central Park. 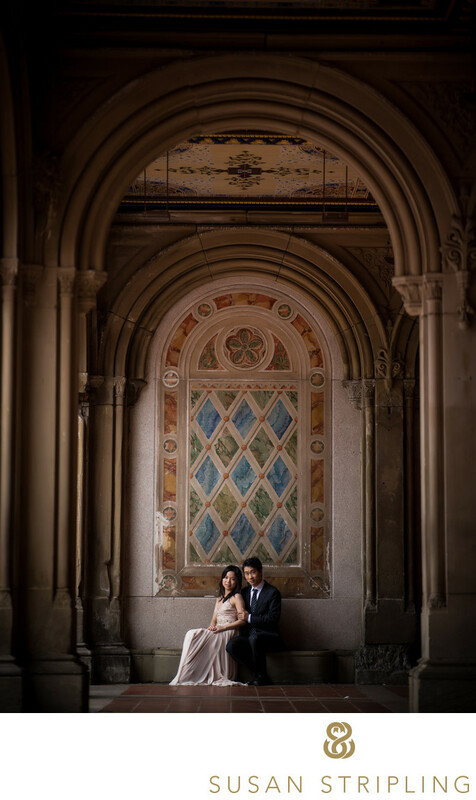 Central Park is a brilliant location for wedding day portraits, and it is gorgeous no matter what season or time of the year. In the spring, Central Park is especially beautiful. The greenery is just starting to emerge from the winter chill, and there is a beautiful watery light that fills the park during these months. In the summer, Central Park is simply brilliant. The late sunset and warm summer light mean that you can take portraits in the park at all hours of the day! In the fall, Central Park is especially phenomenal. 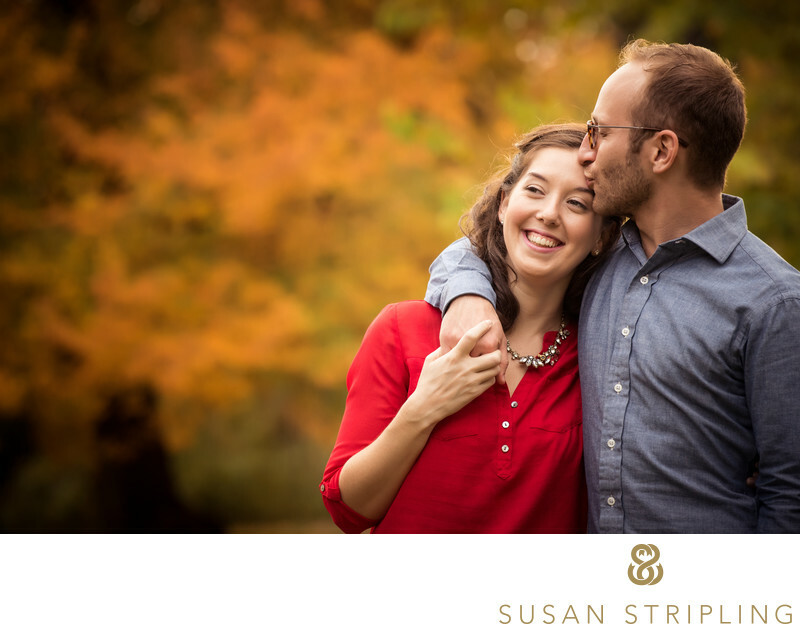 The trees explode in a riot of orange and red, providing a perfect backdrop to wedding day and engagement photographs. As winter is my favorite of all of the seasons, I do love Central Park when it is covered in snow. The crystal clear winter like reflects off of the snow-covered ground, since using your wedding day photographs with a brilliance that can only be found in these months. 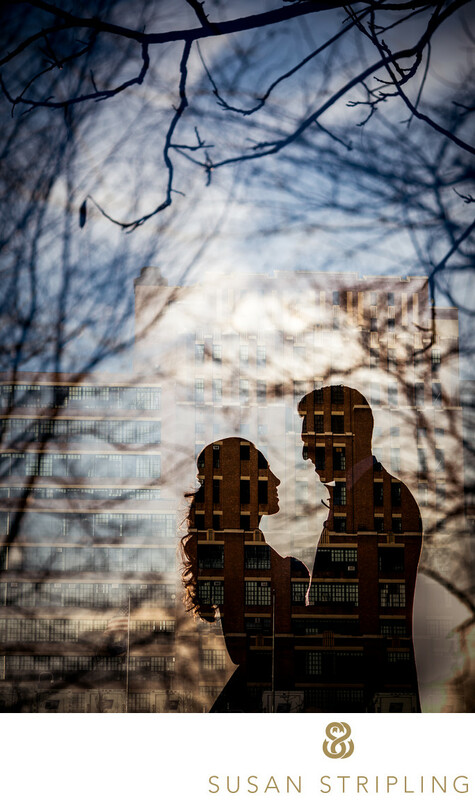 We chose to take the portraits on this couple's wedding day in the southeast corner of the park. This is a really great location, as you benefit from the areas in front of the Plaza Hotel as well as the gorgeous lake at the southeast corner of the park. There are fantastic walking paths, charming tunnels, beautiful archways, and the fantastic juxtaposition of the greenery of the park against the modern city skyline. I especially love that this wonderful couple chose to bring their bridesmaids and groomsmen along for this part of the day. It was really great to be able to take the wedding party photos before the ceremony, as it minimized the number of photographs that we have to take during the cocktail hour. It was also really fun to document this couple in the limousine on their way to and from the park, as this gave us additional time for them to hang out with the friends who are so near and dear to them. After we arrived back to Angel Orensanz, it was time to take pictures of the bride and groom with their family and extended family. Because we talked to a couple before the wedding day, we had a meticulously thought-out list of the people who needed to be there for this part of the day. We had also discussed the number of groupings that they wanted photographed, which made everything even more efficient! We were able to move to groupings of ease, completing this part of the day quickly! After the family formal photographs, it was time for cocktail hour. That's right, the cocktail hour at this wonderful wedding took place before the ceremony! It was a great opportunity for guests and family to mingle and get to know each other before being moved from the balcony areas down to the ceremony site. The ceremony itself was a delight. It's hard to emphasize how amazing Angel Orensanz is for a wedding ceremony. The professional lighting at the venue washed the wall behind the couple with brilliant blue and purple lights. It set the stage for the ceremony in a really wonderful way, and provided a gorgeous backdrop for the couple's touching vows. After the wedding ceremony, there was another brief period of passed cocktails and hors d'oeuvres while the incredible staff at Angel Orensanz turned the ceremony space into a fantastic reception celebration. Guests were invited in and told to take their seats for the introduction of the families, wedding party, and bride and groom. The DJ that the couple hired did a fantastic job of introducing everyone into the celebration. 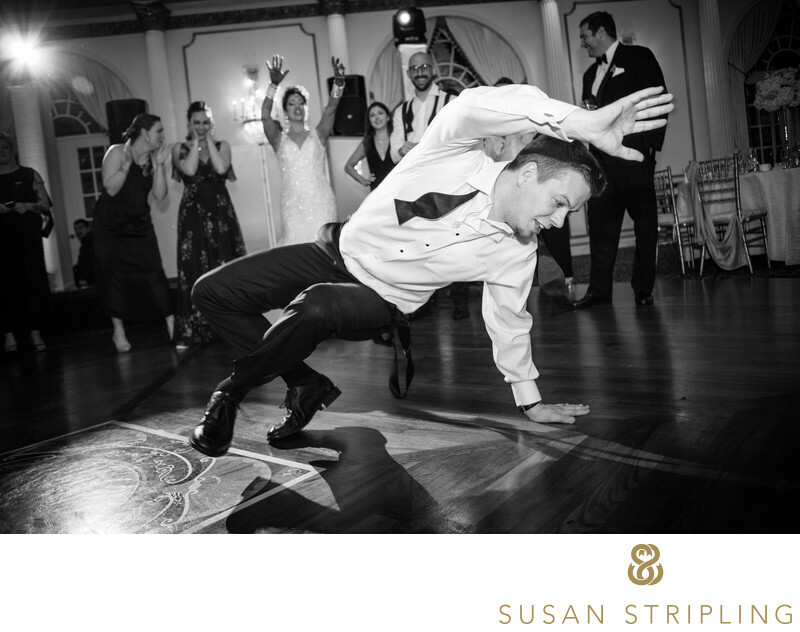 Whereas most weddings go straight into the first dance when the couple arrived to their reception, this party started off with a bang! The hora was the first major dance of the evening, and it was awesome! I especially loved the joy and laughter on the faces of the bride, groom, and their families as they danced together for the first time as husband and wife. Throughout the reception there was heartfelt toasts given by the parents of the groom, the grandmother of the groom, the parents of the bride, siblings, and their closest friends. I always love hearing what family members and friends have to say about the couple! 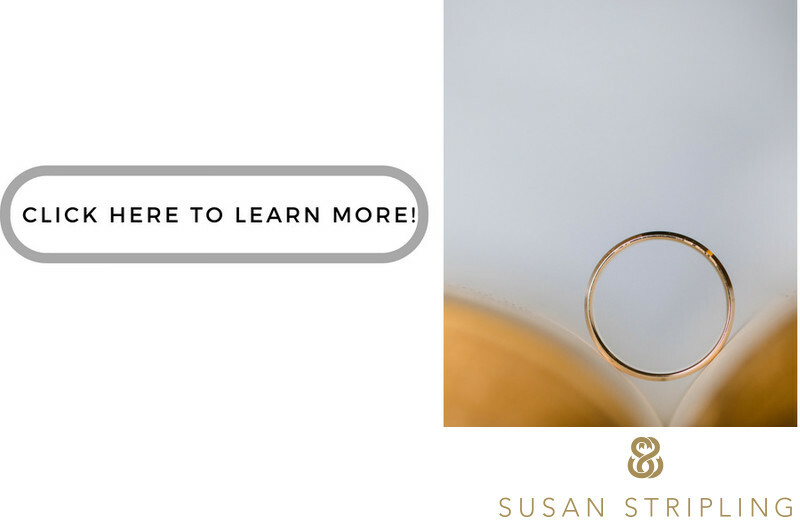 Whether it's embarrassing stories from their childhood or college years, or touching tales of how they first met, the toasts are always a fantastic time for me to get to know my clients just a little bit better! Eventually the bride changed from her wedding gown into a short, sassy, lace dress. She entered the reception for a second time, and the couple took the floor for their first dance. After the first dance, they had a family dance. 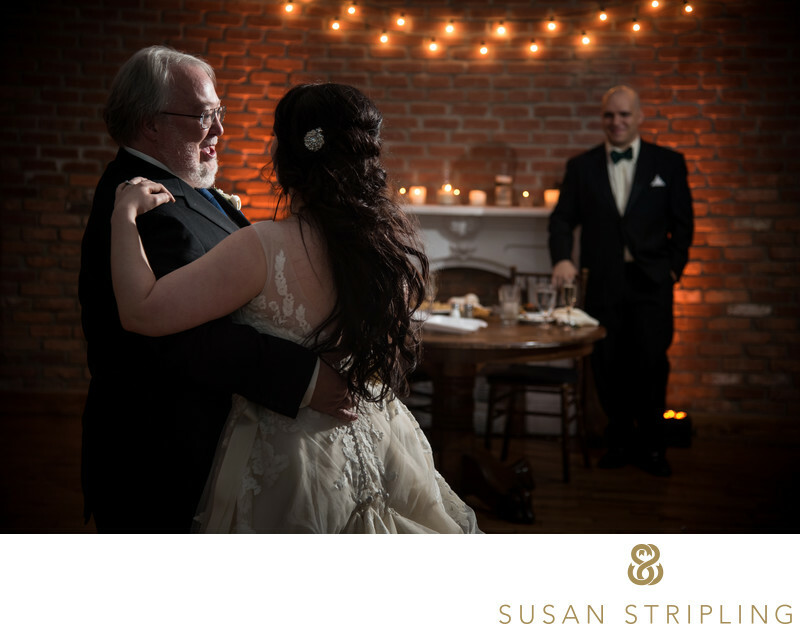 At many weddings, the bride dances with her father and then the groom dances with his mother. At this wedding, the bride and groom had their immediate family joined them on the dance floor altogether. I thought this was really wonderful, and hope to see this charming dance at many weddings to come. Once all of the formalities were over, the bride, groom, their family, and all of their friends dance the night away. There was a photo booth, fantastic food, and open bar, and a DJ playing well into the evening. If you are getting married at Angel Orensanz, I would love to hear about your plans for the day. I would love to help you craft a timeline that allows you to experience your wedding day in the best way possible! Please drop me an email or give me a call, and let's connect soon! 1/160; f/4.0; ISO 3600; 16.0 mm.